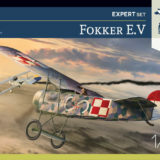 Fokker E.V- vintage German fighter aircraft from the end of the First World War. 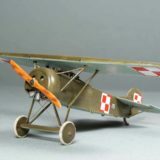 Despite the excellent design, production errors prevented the practical use of this aircraft against Entente’s aviation in the second half of 1918. 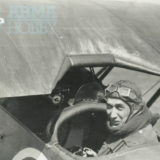 After removing the problems, there was not enough time to put the plane into the fight. 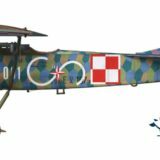 The machines already produced and went to Polish aviation and took part in the battles for the Polish city of Lvov. 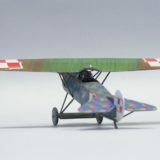 There also, Stefan Stec won the first victory over the Ukrainian Nieuport piloted by the Austrian ace Rudorfer. 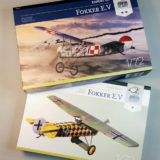 Buy Fokker E.V models in the Arma Hobby model shop. 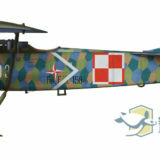 The latest model of Fokker E.V from Arma Hobby goes to our Gallery at www.armahobbynews.pl. 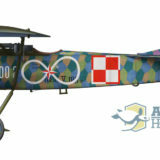 I plan to build a few Fokkers, so the original painting of the first plane of Polish aviation went first. 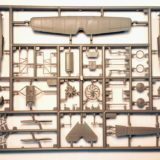 This construction of kit was meant to test build and facilitate the construction of further models based on the new AH plastic parts. 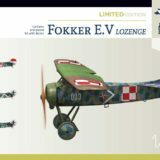 Fokker E.V models are on the way to modelers right now. So it is a good time to show an inbox review of both kits. Let’s go to open a box! As promised to the subscribers of our newsletter, we are showing today photos of plastic injection molds of the Fokker E.V. See how the model presents itself in the final stage of preparation for production. Attrition warfare, so characteristic for the Great War, was performed by the long trench fights aimed on wearing down the enemy and by the naval blockade, preventing the Central Powers from importing resources from abroad. Such situation promoted designing and wide application of many interesting inventions, probably unnecessary during the peacetime.